Passenger trains in Canada can travel up to 160 km/hour and can take up to two kilometres to come to a complete stop. That’s the length of 18 football fields! You should never attempt to cross the tracks when a train may be approaching - trains always have the right-of-way! Whether you're learning to drive or are a seasoned driver with 30+ years experience; treating railway crossings with caution and respect will not only keep you safe but can also prevent serious injury to others. Passive railway crossings will have a yield or stop sign. If a train is approaching, you must yield to the train. Active railway crossings will have flashing lights, bells, and in many cases, gates that come down to block the road when a train is approaching. 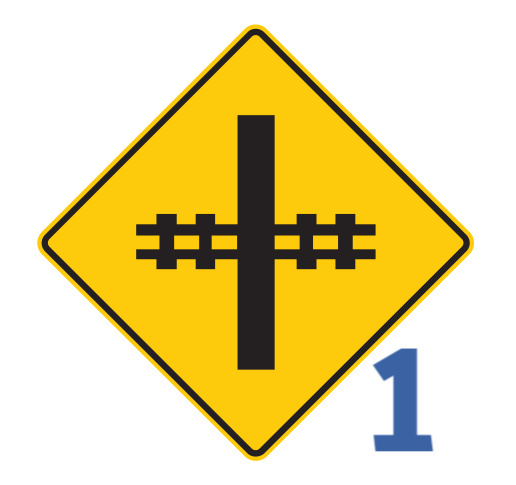 The warning sign with a straight road and tracks crossing (image 1 below) indicates there is a railway crossing ahead and you should be prepared to stop. This could be a passive or active crossing. You will want to scan for stop or yield signs, and oncoming trains. The angle of the tracks on the sign will reflect the angle of the real tracks. Trains can come from either direction so always check that it is safe both ways before proceeding. 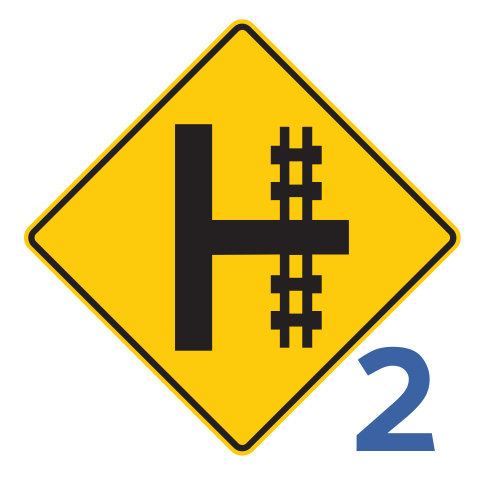 The warning sign with a straight road and side road, with tracks crossing (image 2 below) identifies a railway crossing on a side road ahead. If you are turning onto this sideroad, ensure you scan in both directions, listing for approaching trains and be prepared to stop. An example of an active crossing can have a crossbuck (X) with lights and/or bells (image 3 below). When lights are flashing and bells are ringing, you will want to come to a complete stop before the stop line. Once the lights and bells have stopped, you can check that it is safe and then you can proceed. Active crossings can also have a guard that crosses the road, in addition to a crossbuck, lights, and/or bells (image 4 below). When a train is approaching, the lights and bells will start, and the guard will come down. As soon as this starts, you are required to stop before the guard. In the example below, you can see that there are 3 crossings behind the guard (indicated by the “3 TRACKS” shown on the post), and any of the tracks could be in use. Wait until the guards are fully raised and the lights and bells have stopped before proceeding. In some cases, another train may be passing on a different track after the first train clears. These guards are designed to come off without breaking. This can happen if they are malfunctioning, and come down on a vehicle. If this happens to you, park safely, and contact the number on the guard as soon as possible so they can fix it before another issue occurs. No matter the type of railway crossing you encounter, be sure to keep your distance! Trains can overhang their tracks by as much as one meter on each side. Some loads being carried may exceed the width of the rail cars themselves. With only two wheels, motorcycles and bicycles are more susceptible to loss of balance or getting stuck in the tracks or rails. 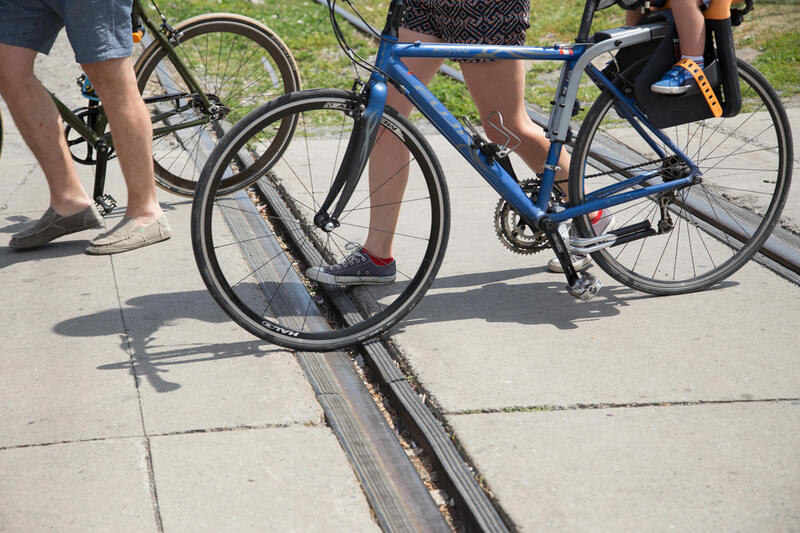 When riding, try to cross the tracks as close to a 90° angle as possible and never cross with less than a 45° angle. Keep a larger following distance when approaching a railway crossing to ensure you never have to stop on the tracks. 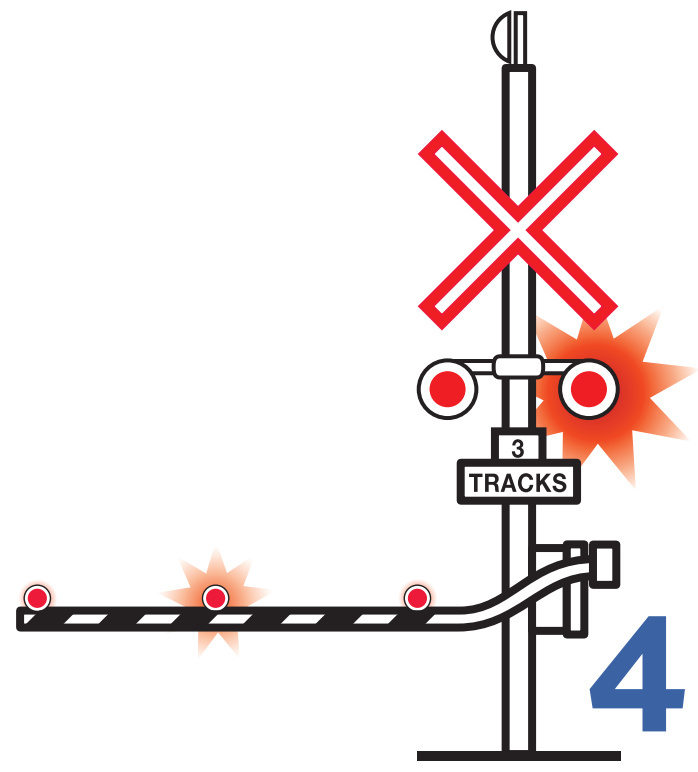 Many crossings have wood around the tracks – between the wood around the tracks and the metal tracks themselves, train crossings can be extremely dangerous when wet. If you do need to brake or change gears, ensure you do this before reaching the tracks to make the crossing as safe and smooth as possible. If you’re cycling, you can also choose to make your way to the curb, dismount, and cross the tracks as a pedestrian. 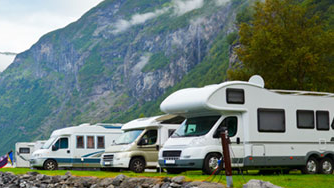 You Got Stuck – Now What? If your vehicle gets stuck on or within one metre of the tracks, turn the vehicle off and evacuate all passengers immediately. A safe distance to maintain when a train is coming is at least 30 metres (almost 100 feet). Make sure you are well out of range of any debris that may occur in case of impact. 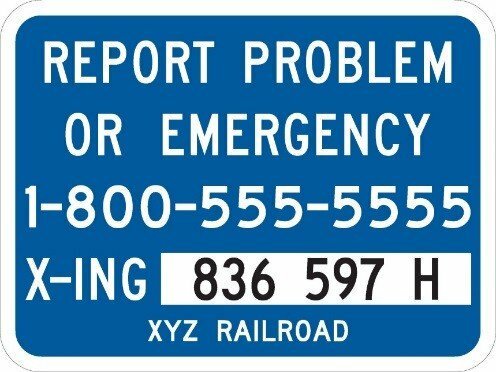 Once all passengers are a safe distance from the tracks, look for the railway crossing identification information and call for help. Do not attempt to move your vehicle if a train is coming. The train may try to slow down, but remember that trains can take up to two kilometers to stop! 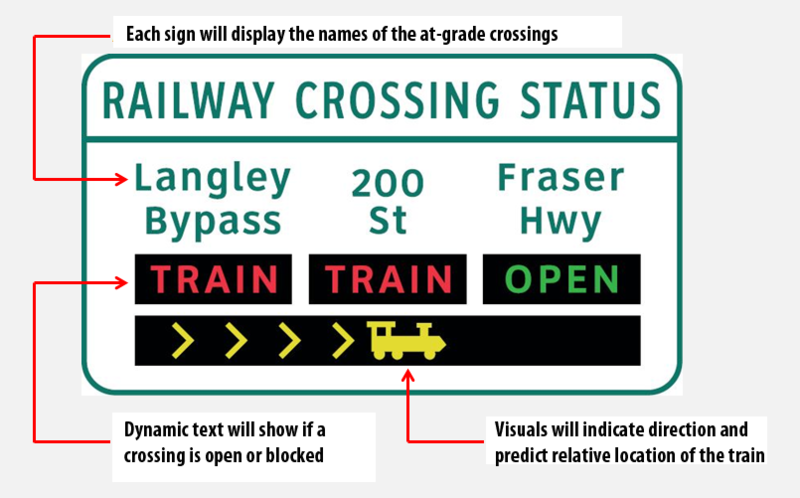 Currently being installed in Surrey, City of Langley, and the Township of Langley, is the Railway Crossing Information System (RCIS). The aim of this new system is to relieve congestion and delays of more than 2 minutes in busy areas that are affected by railway crossings. An electronic sign will display the upcoming railway crossings, whether they are currently open, and which direction the train is going. In the example provided by the image below, we can see that the train is heading towards Fraser Highway from 200th Street, and is already passing the Langley Bypass. 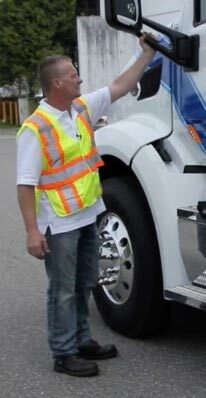 Learn more about these new signs in the Ministry of Transit BC’s informational video. Railway crossings can be dangerous places and should always be treated with caution and careful observation. 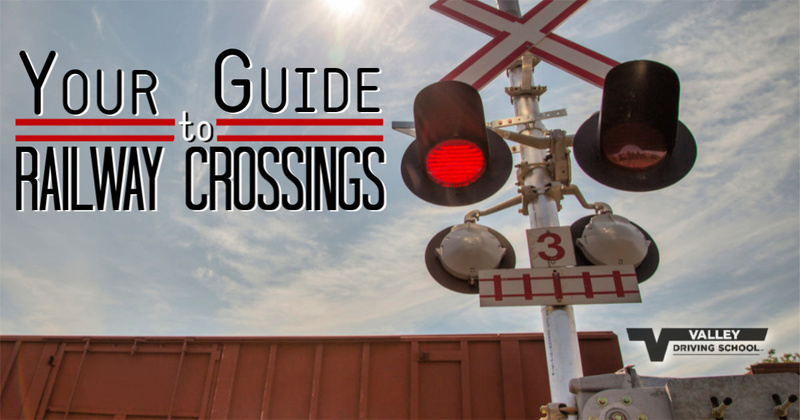 Be aware of your surroundings and pay close attention to the signs and warnings leading up to all railway crossings. Test your knowledge and see how your choices could play out with Operation Lifesaver’s Train to Drive simulator.